Transitioning from learning to read to reading to learn is essential for students moving into intermediate grades, middle, and high school. Adolescent readers must be able to navigate increasingly complex texts and develop the deeper knowledge of the topics they are studying. Reading proficiency is foundational to a student’s ability to master the complex subject matter required in higher grades. Before students can master the 4 Cs—critical thinking, collaboration, creativity, and communication—they must be reading on grade level. Middle and high school students who are not proficient readers fall more and more behind their classmates and are at risk for dropping out before graduation. It is difficult for these students to become successful readers without direct intervention and extensive practice. To help them achieve success, teachers need a comprehensive English language curriculum that leverages the best of teacher-led and online instruction in a blended learning environment supported by ongoing assessments, data analytics and comprehensive literacy guidance for teachers. Students will become motivated for success through research-based, targeted intervention and practice. As their language skills improve, students will not only be capable of reading and understanding complex texts but will also produce more sophisticated writing. Immediate, positive feedback rewards them for developing stronger skills. is a comprehensive ELA program that combines the most current research with motivational, classroom-tested strategies to fill gaps in literacy. Students immediately respond to their teacher and peer coaches, and the age-appropriate content means students stay engaged while they achieve success. Motivating non-proficient readers with a track record of failure is the focus of this webinar from leading reading researcher Dr. Louisa Moats and Sheryl Ferlito, high school reading specialist from Chippewa Valley Schools in Michigan. Getting students to believe that they can become successful readers is an enormous challenge. Dr. Moats and Ferlito discuss strategies to motivate adolescents to achieve reading success. The consequences of poor reading skills are clear. Each year, 1.3 million students drop out of high school, and 70 percent of them have poor reading skills that not only keep them from graduating but also impact their potential lifetime earnings. This report outlines the research base for proven strategies to intervene and turn struggling readers into successful readers. 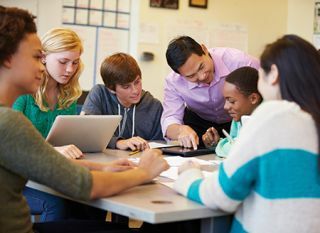 Readers who struggle in middle and high school face unique challenges that must be addressed with specific intervention strategies in a way that develops foundational skills while engaging students in age-appropriate, high-interest topics. This guide clearly lays out the elements of a successful adolescent intervention program so that districts can choose a research-based, effective reading program with confidence. Leading-edge research about what it takes to turn struggling adolescent readers into successful ones is the underpinning for this award-winning reading curriculum. It meets students where they are and takes them to where they need to go with direct instruction and scaffolded practice. It’s effective because it fosters both foundational and advanced learning and effectively engages students to achieve reading proficiency—laying the groundwork for college and career readiness.